Right before the beginning of the economic recession in 2008, the age of full size SUV’s was coming to an end as gas prices were high and the speculation of some lean times coming on the horizon forced consumers to think more practical. Car brands, seeing the direction of consumer behavior in the automotive market, pushed the compact car and integrated some luxury aspects to appeal to buyers on a budget. Fast forward to almost 12 years later and Mercedes Benz is releasing a small four door A-Class that most likely would have been a hit at the end of last decade. Why now? Ford and Chevy are cutting sedans from their lineups, and yet here’s a prestigious German manufacturer adding an affordable entry level car for the US market. To be fair, Mercedes Benz has been pushing the envelope by unveiling vehicles for almost every segment in the automotive world. What’s surprising is that they’re being ambitious in the United States, while rivals and other companies have deprived Americans of forbidden fruit that European, Asian, and South American markets have enjoyed for quite some time. Many have questioned whether the arrival of the A-Class would be the sudden demise of the CLA, yet so far Mercedes has made no indication of getting rid of it, and in fact a refresh is in the works. To say that Mercedes Benz is providing luxury to the masses would be a stretch, because other brands have done this in the past, like the Volvo S40 which in 2006 had a starting price under $30k. However, what we’ve seen this decade from the Germans is essentially an automotive arms race. From crossovers to sportbacks and even electric powered cars, if there’s a segment that hasn’t been exploited yet, Mercedes, BMW, or Audi are usually the first ones to make a move. No matter what the intention is, there’s some excitement behind this little compact sedan, as for the first time we’re witnessing technology features trickle down to a very affordable price range. For performance, the A 220 gets a two liter turbocharged four cylinder engine that gets 188 hp and 221 lb ft of torque with a 0-60 time of 7.1 seconds. Front wheel drive comes standard but for $2k extra at a base price of $34,500, you can upgrade to the A 200 4Matic. It’s inside where drivers and passengers alike will experience premium features in the $40k price range, as in front of them will be a 10 inch digital instrument cluster and 10 inch touchscreen infotainment system. 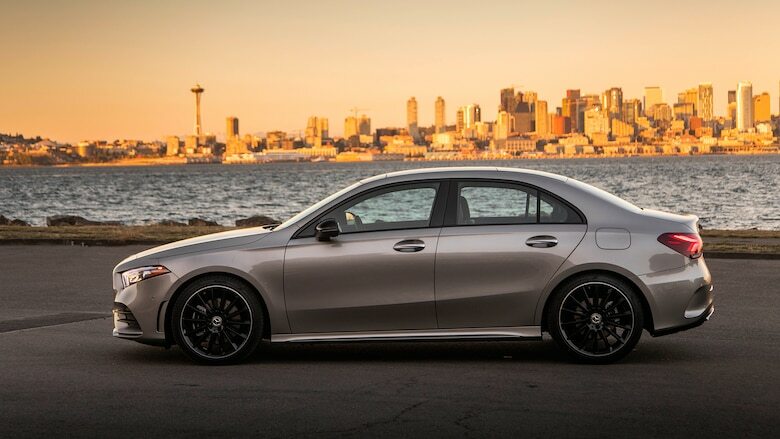 This same setup can be found in the redesigned CLS class, but to have it available at a fraction of the cost in the A-Class puts this small sedan miles ahead of its competition. Heated and ventilated front seats, along with a heated steering wheel and a 64 color ambient lighting display provides occupants with a luxury feel. Another feature that’s amazing to see on an entry level sedan is the augmented reality navigation that utilizes the forward-facing camera to give you live updates of what turn you need to take or direction you should go in. By using the “Hey Mercedes” command, the car will automatically adjust temperature in the cabin, change the mood lighting, and acts as your personal assistant. Unless updates were made, this hands free system does have some bugs that need to be worked on. When the word “Mercedes” is uttered, you activate the on board personal assistant, and there’s been a few videos from journalists who had to find a keyword to discuss the A-Class without being interrupted. When adjusting the climate control, the air vents will either glow red or blue depending on the temperature, and the overall interior styling is much more welcoming than the CLA. The real question is whether all this is enough to entice consumers to get back into the compact sedan segment that’s been mostly forgotten about over the last few years. As mentioned earlier, the A-Class isn’t offering luxury to the masses, but it is however ushering in an era of technology features we would have seen on $100k+ cars just a half decade ago. While it still might not make sense to us as to why Mercedes Benz would introduce a model that’s essentially a twin to the CLA, there is enough for us to be excited about, especially in a market dominated by cookie cutter crossovers.